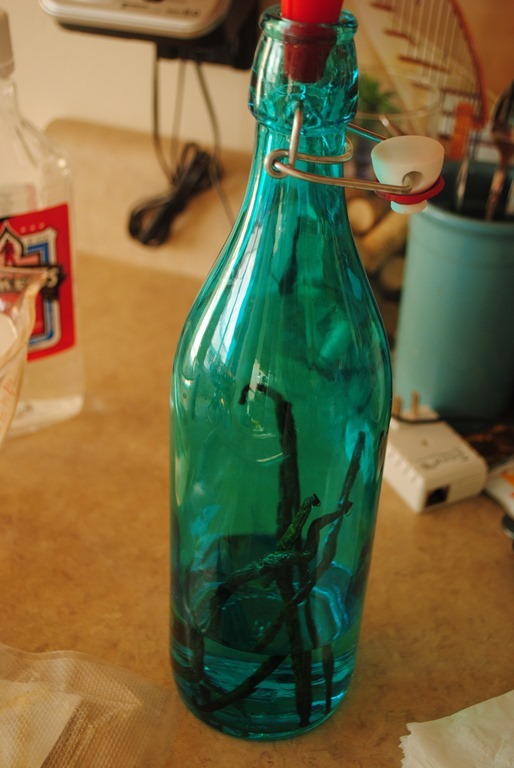 After much talk and procrastination, I decided to bite the bullet and make my own vanilla extract. I bake something every weekend and sometimes again on Mondays; so you can imagine that I go through a lot of vanilla. Recently I noticed that I was buying vanilla extract every week. 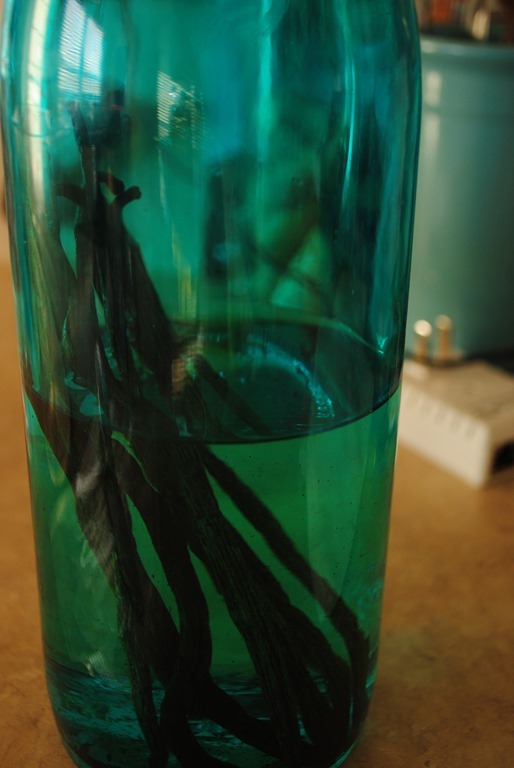 Last year I came across an article online that explained how to make vanilla and give it as gifts to your friends. My friends rely on me to do the baking and when they do bake it usually doesn’t require them to use pure vanilla extract. 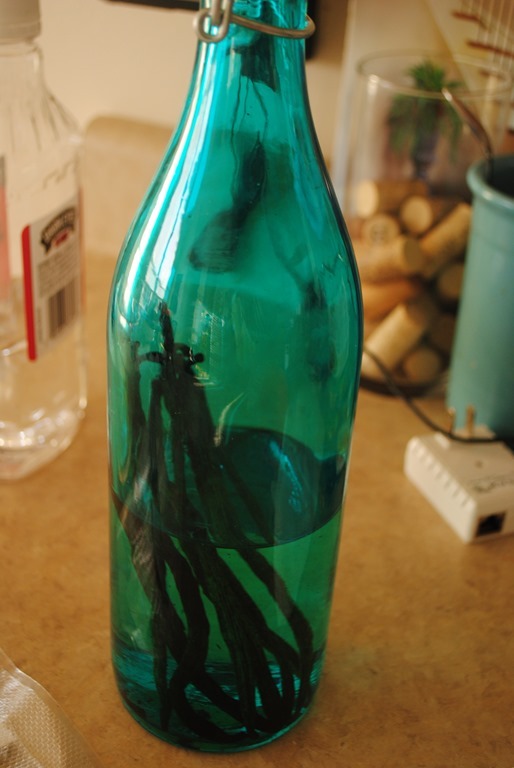 But I was very happy to see that making homemade vanilla extract was quite simple. You needed to get some inexpensive vodka and some vanilla beans. About a month ago, I started putting vodka and vanilla beans on my grocery list. Each week I wouldn’t buy them because I knew I needed a fair amount of vanilla beans (at least 5 for a small amount) and I couldn’t find more than three for around $7-$9. One day, while looking online for the recipe to get exact ingredients measurements, I came across the website recommended to purchase vanilla beans. I went to www.beanilla.com and ordered the Madagascar grade B vanilla beans. The grade B beans are recommended to use to make vanilla extract. I bought 10 beans for $7.99. I also ordered some vanilla paste. 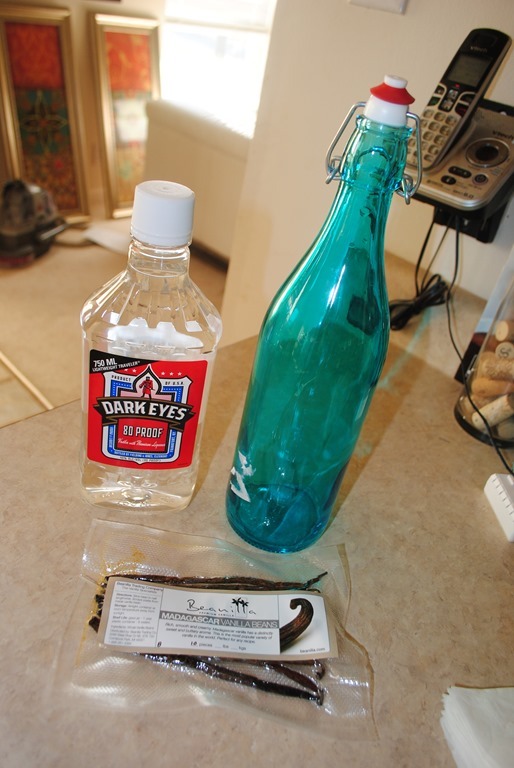 While out grocery shopping, I bought a bottle of Dark Eyes vodka (my husband called it gut rot); I need an inexpensive vodka and it was on sale. Meijer had these beautiful bottles on clearance and I bought a blue one. I had a crazy busy day on Saturday, but I had my Sunday mapped out…I was going to make my vanilla extract, make the praline sweet potato pie, a mini sweet potato cheesecake, make red pepper jelly (to go with the jalapeno poppers we were having with the football food dinner – shrimp po boys and homemade onion rings) and try to rest because after a week of doctoring, my babydoll had passed on her light cold. I know, I know if I’m sick what would make me want to cook, right? Well, that’s my thing, I get sick I want to eat and cook. 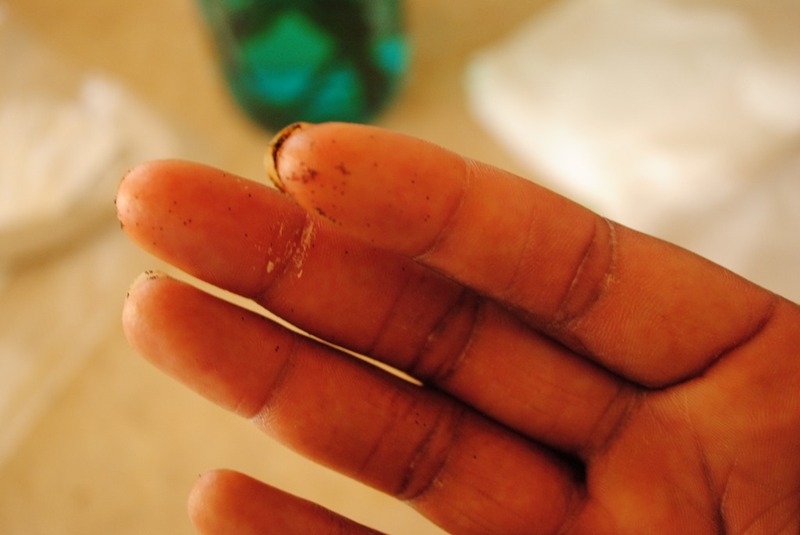 So I get in the kitchen, wash my hands so much they start to chaff and refuse to open my mouth for anything. I usually end up with some pretty good stuff. I’ll tell you more about the other recipes a little later. Back to the vanilla extract. I started by slicing my vanilla beans. Not completely through and not from end-to-end. I started about ½” from the end and cut to about 1” from the other end. I decided to slice open 5 of them to see where that would put me with my 1 cup of vodka in my bottle. Here’s my finger tips covered in little vanilla bean seeds after cutting them. I dropped them in and added 1 cup of vodka. I still had plenty of room left in the bottle so I added the other 5 beans. Then another cup of vodka. I still had room in the bottle and about 1 ½ cups of vodka left in the bottle. I had no more beans, but did I want to leave that vodka in the bottle? We weren’t going to drink it – after all my husband called it gut rot and we had the good stuff in the fridge. So I started pouring into the bottle. I chickened out about ½ cup in. I didn’t want to mess up my first foray into extract making so I stopped. I poured the vodka back into its bottle to be used when my extract starts to run low. I stopped up the bottle and gave it a little (okay a vigorous) shake and placed it on the shelf in my pantry. I’m not showing you a picture of my pantry because it is a fright. I plan to change out the wire shelves to actual wood shelves soon and add baskets and all kinds of nifty storage stuff and lights. But I haven’t done that yet therefore you do not get to see my dirty little secret. I will keep you informed of my extract progress however. I am to give the bottle a shake once a week for the next eight weeks and then it will be ready for use. I’m so excited and proud of myself. I’m thinking lemon and orange extract are next on my list of homemade extracts. What do you think?